Spicy Treats: Mashed Potato Fritters ~ Vegan N Gluten Free !! Today's recipe is simple and easy tea time snack, Mashed Potato Fritters or Potato Pakoras. I just made these fritters, clicked in hurry and now started with this post and I am busy with munching these crispy and yummy fritters. Mmmmm, so yummy!! Boil potatoes, then peel the skin and mash it well using potato masher or spoon n keep aside. In a bowl, add mashed potato, finely chopped onions, cilantro, ginger, n shredded carrots and mix everything well. And in another bowl add all dry ingredients, gram flour, rice flour,salt,chili powder and hing mix well then add the dry ingredients to the potato mixture and combine well. Sprinkle water and mix well to a tight dough(will be bit sticky, thats ok but not too much of moisture). Now heat oil in a wok/kadai, when its get really hot, pinch a small amount of dough slightly flatten it using finger tips and drop it hot oil. Fry in medium high heat, after 1 or 2 minutes turn other side and fry till it turns light golden brown and crisp. Once done remove from the oil using slotted ladle and drain the excess oil in paper towel. Do repeat the same for all remaining dough. That's it...yummy n crispy Potato Fritters ready. Serve With any desired sauce or simply enjoy with ketchup and a cup of Masala Chai or Espresso Coffee. Instead of chili powder, u can use finely chopped green chilies. U can also add any desired chopped or grated vegetable to this fritters, like broccoli,cabbage,cauliflower,spinach,beets,etc. After frying a batch of fritter, wait for a minute to get oil hot again n then start dropping the second batch and fry in medium high heat. Do not add water than the mentioned amount to the dough mixture, moisture from the potato, onion n carrots itself enough to bind. If u add more, your fritters won't turn crisp n also it absorbs more oil n turn soggy. Didn't tried toasting it in tawa/griddle as i don't want to waste the stuff again. 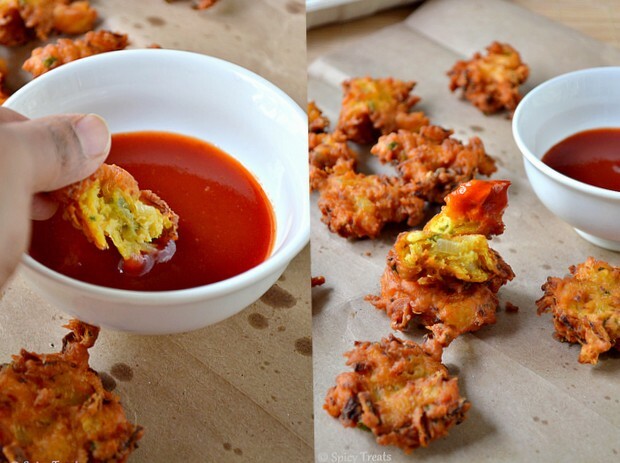 Prefect fritters for chilled evening snacks, super crispy beauties,feel like having some. Perfect for rainy day here. Delicious snack.. Reminds me of the hashbrowns we get in Dunkin donuts which almost taste like Vadai.. My daughter loves it.. Should try making her your version.. Very inviting..
Crunchy munchy snack for the autumn. Looks so addictive. Crunchy yum snack for this cold evening. Very yummy and inviting snacks for monsoon evening. Fritters looks so scrumptious.As always beautiful clicks. Rice flour must have made them crunchier... they look so good that its impossible to resist.. think ll make some with lunch today! Looks so delicious and perfectly fried! Love it!! Crispy delicious snack...Looks yum...Lovely clicks.. Your delicious recipe has been nominated as one of the "Top 100 Best Potato Fritters Recipes on the Internet". You can view it and vote for it here: http://potato-recipes.org/best-potato-recipes/best-potato-fritters-recipes-internet/ (position #93). Can you substitute the besan flour with any other type of flour? Sorry. I haven't tried with any other flour. Can't help!